Flanked by the state's top legislative leaders, Gov. Greg Abbott announced Thursday that both chambers of the Texas Legislature will push to curb property tax growth by limiting how much money local governments collect without voter approval. Fellow Republicans Lt. Gov. 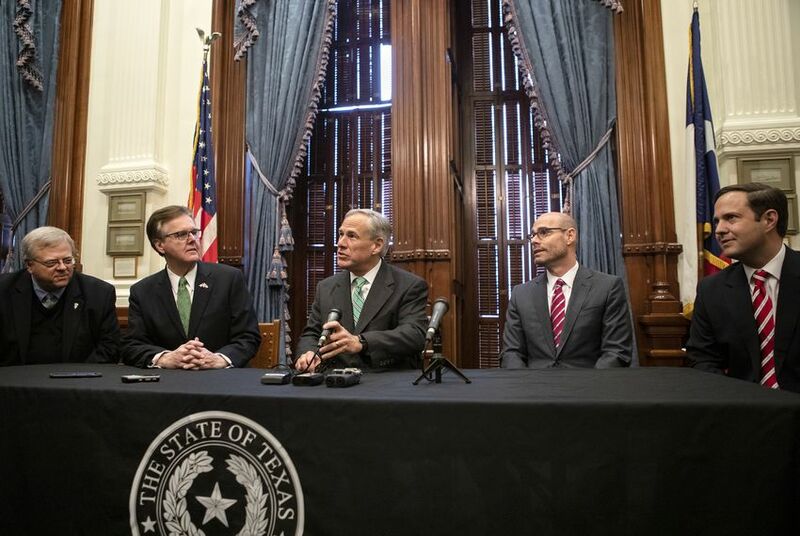 Dan Patrick and House Speaker Dennis Bonnen, as well as the heads of both chambers' tax-writing committees, joined Abbott in making the announcement. Their news conference followed the filing of identical bills in both chambers, Senate Bill 2 and House Bill 2. Abbott said it was "completely unprecedented" for lawmakers to be so closely aligned on such an important issue this early in the session. "Most importantly, it's a testament to the voters in this state," he said. "The voters demanded this, and this demonstrates that the Texas Legislature is responsive to the needs of our voters." But two Democrats who sit on the House Ways and Means Committee said the proposed legislation is far from being a done deal. And an advocate for city governments said there are plenty of unintended consequences that need to be worked out. Chief among them is ensuring that cities aren't suddenly unable to afford police officers and firefighters. The legislation does not apply a cap to individual property tax bills. Because it would limit only how much government entities can collect in property tax revenues before getting voter approval, an agency could stay below the rollback election rate, and that portion of a property owner's tax bill could still increase. Local officials are almost certain to to push back. Bennett Sandlin is the executive director of the Texas Municipal League, which advocates for city governments. His organization estimates that about 150 of the state's largest cities would be affected if the legislation passes. He said that the rollback threshold is lower than inflation and could prevent cities from paying for first responders' raises, filling potholes, and keeping recreation centers or libraries open. "It is actually a service reduction," Sandlin said. "Starting at 2.5 it seems like a pretty uphill battle," state Rep. Eddie Rodriguez, D-Austin, said at a press conference Thursday afternoon. “Speaker Bonnen is committed to all 149 members being a part of this process," Rodriguez said. "He said that to me personally." Rodriguez and state Rep. Trey Martinez Fischer, D-San Antonio, criticized the legislation for not including the state's plans for spending more on public education. They’re worried that lawmakers will cap property tax growth without replacing the revenue for schools. "This raises more questions than it does answers," Martinez Fischer said Thursday. “An arbitrary revenue cap, one that will also make it more difficult for local communities to fund public safety, is not going to solve this problem," said Turner, who also chairs the Texas House Democratic Caucus. "We ask you to come to the table and work with us on behalf of the taxpayers that we all represent, but you will not be dividing the House and the Senate and the governor on the solution," Bonnen said. "So join us in finding the right solution because we’re already joined together." Sandlin worries that because the proposed revenue caps wouldn't apply to smaller taxing entities, lawmakers who represent rural areas will be more apt to support the bills. That could leave legislators from urban areas alone in a fight against the 2.5-percent threshold. "It's a bit of a divide-and-conquer strategy," Sandlin said. Bonnen called the unveiling of the legislation "the first step in solving the biggest problem facing Texas taxpayers." State Sen. Paul Bettencourt, R-Houston, the chairman of the new Senate Property Tax Committee, and state Rep. Dustin Burrows, R-Lubbock, the new chairman of the tax-writing House Ways and Means Committee, joined the state leaders at the news conference. The participants traded some jokes as they rolled out the legislation, at one point musing that they should call it "HB 2.5" instead of HB 2 — a reference to the proposed rollback rate. Sandlin didn't find humor in the proposed 2.5-percent cap, though. "It's just draconian compared to prior versions," he said.